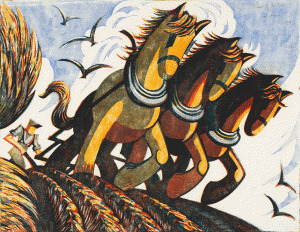 Sybil Andrews Morgan was best known for her work as a printmaker and her modernist linocuts. Her introduction to art took place in the form of a correspondence course with John Hassall while she was working in Bristol as an oxyacetylene welder during the First World War. She then studied with Henry G. Massey at Heatherley School of Fine Art, London, and in 1922 with Claude Flight at the Grosvenor School of Fine Art, London. In 1991, Andrews donated 575 works of art, including oils, watercolours, drawings, woodcuts, and drypoints, to the Glenbow Museum. Her work has been exhibited all over the world and is owned by the Glenbow Museum and the Victoria and Albert Museum, London.